In yet another opportunity to gain a game on the Texas Rangers, the Mariners were absolutely shut down by the Angels and Jered Weaver. The game started off poorly as Doug Fister gave up a four spot and the Angels batted around in the first inning. Fister settled down after that and held the Halos to just 2 hits through the next 5 innings, both singles. Weaver only gave up 4 singles the entire game before the ninth inning when Ichiro led off with a double. Once again, with a runner in scoring position and nobody out, the Mariners fail to even advance the runner to third as Ryan and Smoak popped out to shallow outfield and Kennedy followed by fouling out to 3rd to end the game. So just 5 hits, 0 runs and once again we find ourselves with absolutely no production. 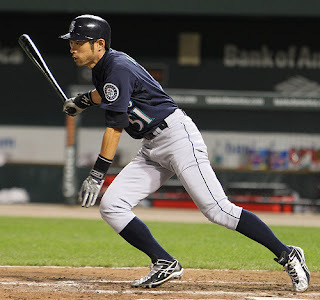 Ichiro got 2 hits, Carp got 2 hits and Figgins got a hit, that's it. This has to be one of the most difficult teams to watch this year. One day our offense will come out with a vengeance and hit four HR's and score 7 runs and then we can go 3 days without getting over 5 hits a game. Ichiro is back, hitting yet another multi-hit game, but now that he is back, other bats have gone silent. Figgins got a hit again today, just so happens that it was a different inning than Ichiro's hits. Halman hit into a double play in the 5th. Ryan hit into a double play in the sixth. That's just the kind of night it was against Jered Weaver. Awful! The Rangers did get beat by the Yankees and the A's got beat by the Royals but the M's lose ground on the Angels as they start nipping at our heels for the second place spot at just a game and a half back. We're back at .500 ball and the spurt of wins that we were running into have seemingly come to an end and teams are now going to make us start to earn them. We have now lost another series and try to avoid the sweep tomorrow. It's Erik Bedard versus Ervin Santana. Bedard has been throwing well this year and we can only hope that he brings his 'A' game tomorrow and the rest of the team come prepared to hit. LET'S GO MARINERS!!!! !